Today is one of those winter days that trick you with sunshine. You think it's going to be all happy and motivating, and then you step outside and get slapped in the face with a snow tornado. And I'm not saying that exaggeratingly - little swirls of snow keep popping up everywhere this morning. It's GROSS outside. So, may I recommend one of the most comforting comfort foods on the planet this weekend? 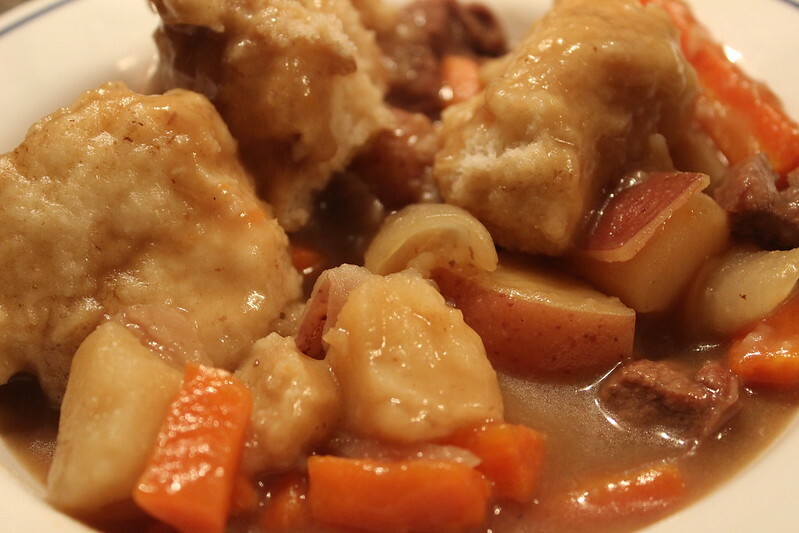 It's my Grandma's beef stew and dumplings. Well, sort of. I was "told" the recipe rather than actually given it, and never actually wrote it down. So I do things by memory and then change things as I see fit. Until now! Because I'm about to put it in writing for all of us. And, score, for those of us that are Gluten Free....because I'm gonna tell you how to get those pillowy biscuits on top the G-free way. 1. Season the meat with salt and pepper, then sprinkle with flour (GF if you're keeping it g-free! ), toss them around to coat. 2. In a large pot, heat up a little olive oil, then drop the meat in to brown on the sides. The goal isn't to cook the meat all the way through, but to get a little searing on the sides. Flip them around now and then. 3. While the meat cooks, peel your carrots, and then chop them along with the potatoes (I leave their skins on). You can also chop your onion now however you like them - I don't love onions so I leave mine pretty big to make picking them out easier. The garlic is up to you - throw in a whole clove or two that you can fish out later (crack it first so the flavor gets out), or you can mince/grate a clove into the pot. Depends on how garlicky you like it. 4. 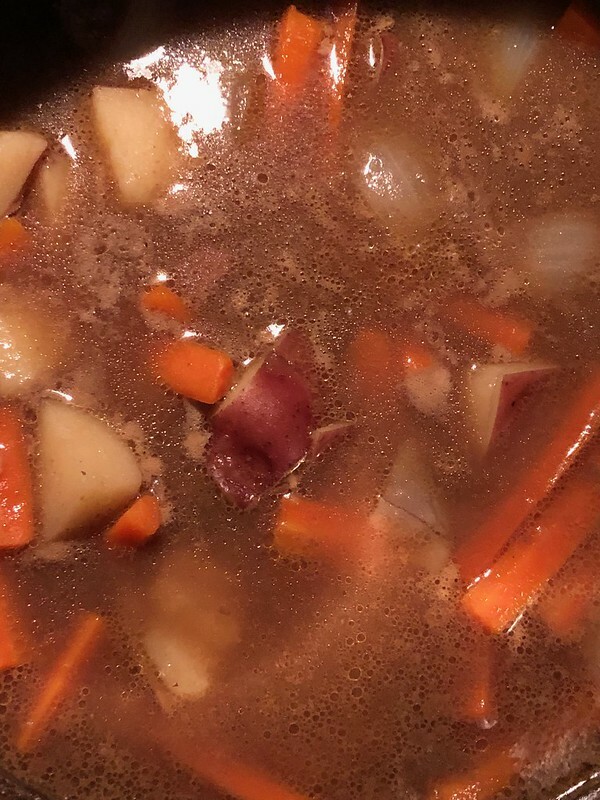 When the meat has seared a bit, toss your veggies in, then fill the pot with enough beef stock to cover everything in the pot. If you don't have enough, you can always add a little water. Season with some salt and pepper, and then add in a few bay leaves. 6. 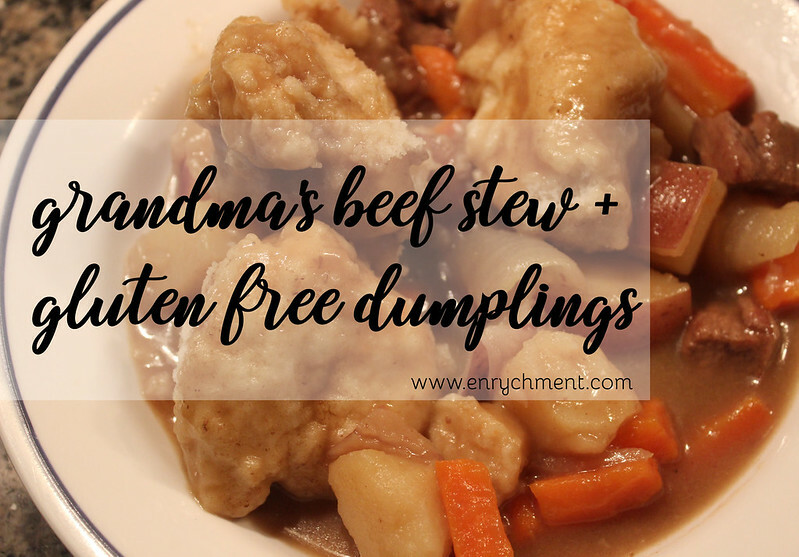 Mix up your dumplings! I am super scientific about this. I throw a whole bunch of gluten free bisquick into a mixing bowl, and then I pour in a little milk and stir it up. And if it's too thick I add some more. See, pro. (This is why I'm not a food blogger.) It should be a little wetter than a normal biscuit mix (heyyyoooo), but not soupy. 7. 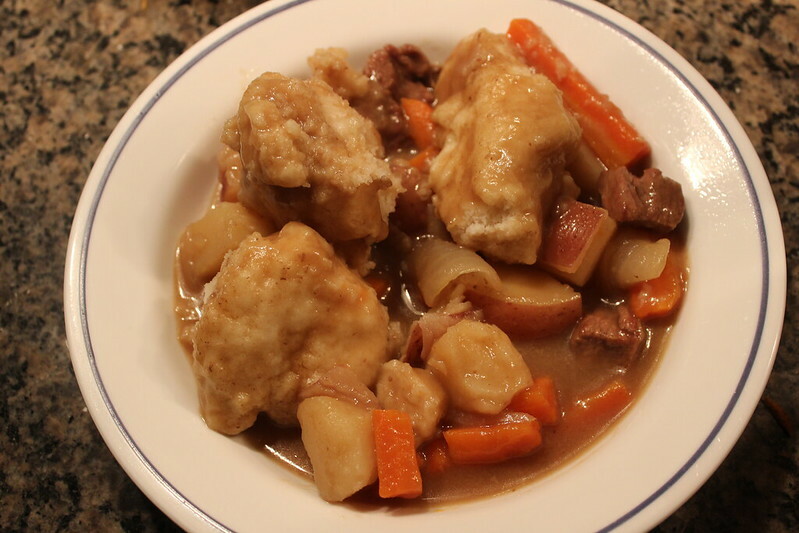 Then you just plop blobs of the bisquick on top of your stew. Just throw 'em right in there! All over the surface. Don't let this photo fool you....I jam in as many as I can fit. They're the best part!! 8. Put a lid on the pan and let the dumplings cook on low-ish (I keep mine around a 4 on my stove) for about 20 minutes. Check them at this point...if they still look a little under done or too wet, take the lid off and let them cook for another 5-10 mins. That, is, it. Bowl it up! You can season it with more salt + pepper if you like, of course. My grandma had this in her regular rotation, and just the smell of it brings me back to winter at her house. 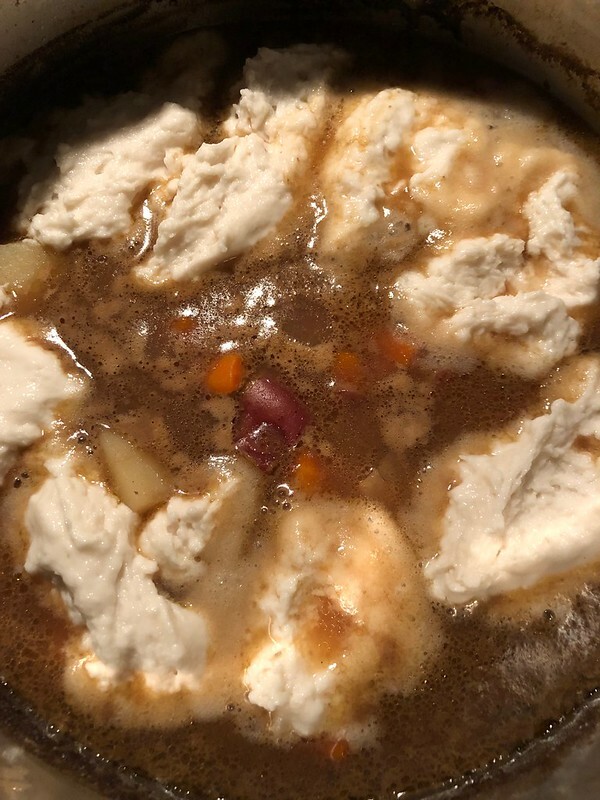 I'm pretty sure she just used water instead of stock, and probably did things a bit differently (aka, more accurately) than I do. But it for sure fills in for her pots of stew. PS - I used to eat the leftover bisquick mixture, straight out of the bowl when she made dumplings. Is that gross? I don't care. Raw bisquick is gold.